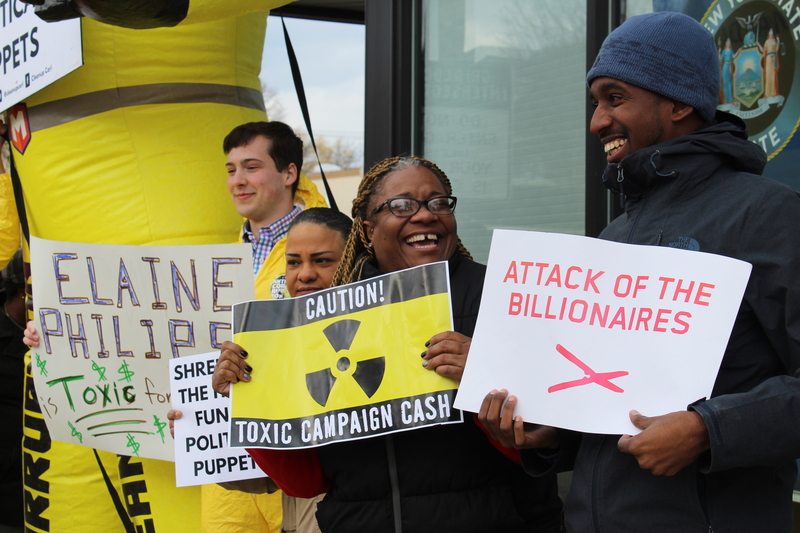 Union workers, a hazmat-suit wearing balloon and a punk rock guitarist walk into a state Senator’s office. What do they get? At least not from state Sen. Elaine Phillips (R-Flower Hill). Members of the activist groups, Clean Up Carl, Hedge Clippers and MAYDAY America, along with members of the Communications Workers of America – and a guitarist, Samoa Moriki – held a rally outside Phillip’s Mineola office on Thursday. The group is calling on Phillips to come out in support of closing the carried interest tax loophole. The Democrat-controlled state Assembly budget proposal, which was released Monday, includes a measure to do so. There are two weeks until the budget is passed. The group went into Phillips office and asked to speak with her to ask her position on closing the carried interest tax loophole. A member of her staff said Phillips was not around and he was not able to comment on her position. She did not comment directly on the carried interest tax loophole, which does not violate campaign finance laws. Members of Communications Workers of America attended Thursday’s rally. The carried interest tax loophole allows hedge fund managers to be taxed at about 20 percent, rather than the ordinary maximum income tax of about 39 percent. 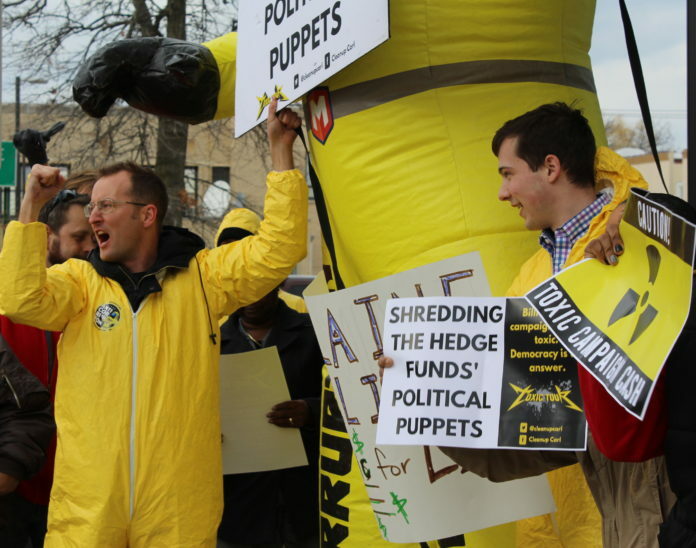 In some cases, hedge fund managers are being taxed at rates lower than their secretaries, said Billy Easton, executive director of Alliance for Quality Education. “Being a hedge fund manager is like running a scam operation,” Easton said. Hedge fund managers invest other people’s money and get a cut of the profit, Easton said. Their income is not considered income, and is taxed as a capital gain, he said. “The pay I get at work is called my salary and I pay taxes on it,” Easton said. Those investors, are taking their wealth to invest in politicians across the state for political influence, according to Tallent. The group is on a Toxic Tour, addressing five state senators. On Thursday, they also held a rally outside the office of state Sen. Carl Marcellino (R-Syosset). Of the senators, Phillips is the biggest recipient of “wall street, hedge fund, toxic campaign cash,” Tallent said. Phillips received $2.6 million in hedge fund PAC donations since 2014, according to Tallent. Marcellino took in $900,000 in hedge fund PAC money, according to the activist groups.